The Connecticut Law Tribune has release information regarding the resignation and disbarment of some prominent lawyers from Connecticut. A Seymour and a Stamford attorney have both decided to resign, and a Greenwich attorney has been disbarred. These are only three cases of the many lawyers who were facing disciplinary action last month. According to the state's Grievance Committee, ten different state attorneys were facing disciplinary actions in the form of suspensions, disbarments, and more. The Connecticut committee decided to terminate Paul Vallillo's interim suspension officially on March 11th. Vallillo, an attorney based in Prospect, had violated some regulations surrounding his Trust Account. He also failed to respond to the bar counsel in a timely manner. William McCullough filed for resignation after his history of professional misconduct was made public. The Stamford attorney's resignation was affirmed on March 6th. McCullough refused to comply with the committee was attempting to audit some of his records. William Scher is an attorney hailing from the Greenwich area. He was officially disbarred in the state of New York for his mismanagement of client funds. New Jersey and Washington, D.C. followed suit and disbarred the attorney in their states. 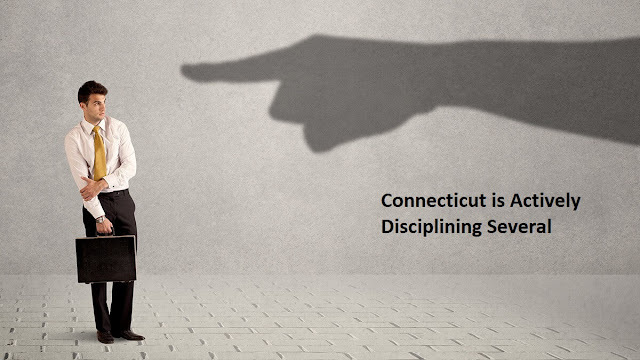 Connecticut joined the trend and disbarred Scher for seven years. The suspension took place on March 26th. Prescott May was another Seymour attorney who was found guilty of misconduct. May failed to reveal his expenses and fees to a client. Despite the allegations, May gave alternative reasons for his resignation. He claimed that he was suffering from a form of dementia. The motivation behind his resignation was for health and personal reasons. The committee processed his official resignation on March 21st. In 2018 Frederick Oberlander was suspended from the Bar due to illegally obtained evidence resulting in uncovering sealed documents from the US State. He violated several court orders in the case against Bayrock Group. The committee brought two separate cases against Enfield attorney Stephanie Czap. The primary allegation claims that Czap transferred money from the account of a client without providing an explanation for the movement of funds. It was ruled by the committee that Czap's actions in this case were unethical. The second allegation is currently pending a final consensus from the committee. Czap allegedly violated many different rules of conduct when she mishandled a client's estate. Attorney Kevin Lynch was forced to pay $200 in damages after a formal complaint was filed regarding a pay dispute. Benjamin Hume, another Connecticut attorney, had to pay his client $1,000 per month for a total of 15 months because of one complaint that was levied against him. Corey Heiks was found to have violated the rules of conduct and received a harsh reprimanding. The case stemmed from another lawsuit that was filed by one of his clients involved in a criminal dispute. Elizabeth Kopec was forced to partake in education courses related to real estate law and legal ethics. The committee set these conditions in motion after Kopec was related to a complaint filled out by a client in regards to a real estate issue. Thomas Rome is currently on one-year probation issued by the court. The Hartford attorney was on the receiving end of an ethics case that led to this suspension. Under his probation, Rome cannot accept new clients in the state of Connecticut. He also cannot file new appearances on any cases that currently exist in the state. Robert Wynne is an attorney from Glastonbury who faced disciplinary action in January. The committee gave Wynne a temporary suspension because of an overdraft from his trust account. Although the committee requested an explanation, Wynne never provided an official statement. He was suspended for two months earlier this year for failing to communicate with the new lawyer of a former client about alien settlement. He failed to communicate on several different occasions.